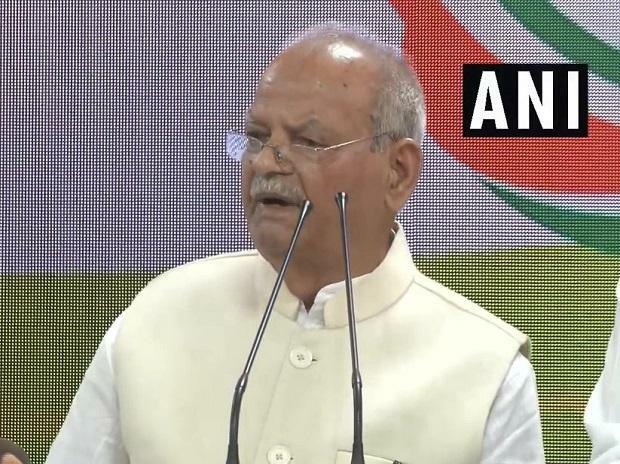 Former Union telecom minister Sukh Ram and his grandson Aashray Sharma on Monday joined the Congress, AICC in-charge for Himachal Pradesh Rajni Patil said. Sukh Ram and Aashray Sharma met Congress president Rahul Gandhi and joined the Congress. A formal announcement will be made shortly at a press conference, Patil told PTI. Sukh Ram had to resign as the communications minister in the Narasimha Rao government in 1996 in the wake of a financial scandal involving a purchase of telecom equipment from a Hyderabad-based private firm. Aashray Sharma, son of cabinet minister Anil Sharma in the Jai Ram Thakur-led BJP government in Himachal Pradesh, seeks to contest from Mandi parliamentary seat. He quit the BJP after the saffron party renominated its sitting MP Ramswaroop Sharma from Mandi. Aashray's father Anil Sharma had been a part of Virbhadra Singh-led Congress government in the state from 2012-17, but joined the BJP before the last state assembly elections. The latest development has put Anil Sharma in a spot. Whether he will quit the ruling party in the state and campaign for his son or stay put with the BJP and cheer for the party's Mandi candidate will be clear only in the coming days. On asked whether Aashray will be announced Congress candidate from Mandi, Patil said his name will be considered and final decision will be made known on March 29. Mandi is also the home district of Himachal Pradesh Chief Minister Jai Ram Thakur. Aashray's grandfather Sukh Ram also wields considerable clout in the Mandi segment from where he was elected as an MP thrice.